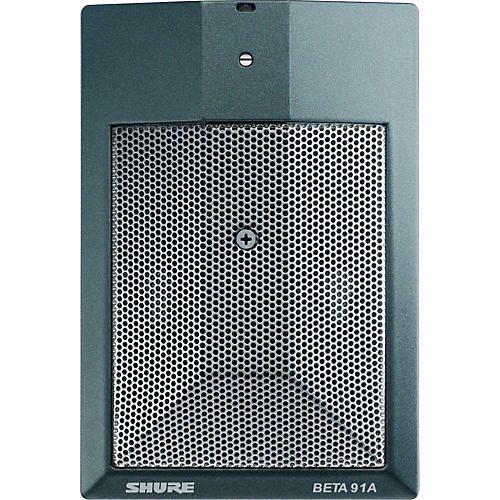 The Shure Beta 91A is designed for use with kick drums, as well as other traditional low-frequency applications including piano. Featuring an updated microphone capsule, integrated preamplifier, and XLR connection, Beta 91A offers a strong low-frequency response and is specifically tailored for bass frequency applications. The Beta 91A combines superior attack and punch for studio-quality sound, even at extremely high sound pressure levels (SPL). A 2-position contour switch maximizes attack and clarity depending on application. Select the flat response setting for natural sound in most applications or the "low-mid scoop" setting for a strong low frequency "punch" with plenty of higher frequency attack. Requires phantom power. Comes with zippered pouch.